Shop online for over 900 herpa model trains at discounts up to 70%. Roadway is the most popular of the 9 herpa model trains categories, then Buildings, and Figures. This is the HO Scale EconoCars - American Automobiles (Plastic Models - No Moving Parts) - 1960s Coupe #1 from Herpa Models. This is the HO Scale EconoCars - American Automobiles (Plastic Models - No Moving Parts) - 1960s Coupe #2 from Herpa Models. This is the HO Scale Semi Trailer (No Tractor) - 40' Dry Box Van from Herpa Models. This is the HO Scale Semi Trailer (No Tractor) - 27' Box Van - No Dolly from Herpa Models. This is the HO Scale Semi Trailer (No Tractor) - 40' Reefer Trailer from Herpa Models. This is the HO Scale Semi Trailer (No Tractor) - Elliptical Tank Trailer from Herpa Models. This is the HO Scale American Trucks - Tractor Only - Kenworth W-900 3-Axle Conventional - Short Chassis - Painted by Herpa Models. This is the HO Scale 36' Gravel Dump Trailer - Assembled - Silver from Herpa Models. This is the HO Scale American Trucks - Tractor Only - Mack - CH 603 Conventional w/Short Chassis Dual Rear Axle by Herpa Models. This is the HO Scale Herpa Military - Accessories - Artillery Shells on Pallets from Herpa Models. This is the HO Scale Semi Trailer (No Tractor) - Round Chemical Tank from Herpa Models. This is the HO Scale 27' Gravel Dump Trailer - Assembled - Silver from Herpa Models. This is the HO Scale American Trucks - Tractor Only - GMC - General Conventional w/Short Chassis - Painted by Herpa Models. This is the HO Scale Semi Trailer (No Tractor) - 48' Flatbed Trailer from Herpa Models. This is the HO Scale Semi Trailer (No Tractor) - 40' Flatbed Trailer from Herpa Models. This is the HO Scale School Bus - Assembled - Yellow, Black from Herpa Models. This is the HO Scale MB Sprinter Van by Herpa Models. This is the HO Scale Semi Trailer (No Tractor) - 40' Container Chassis Only from Herpa Models. 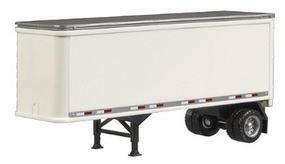 This is the HO Scale Semi Trailer (No Tractor) - Converter Dolly Only from Herpa Models.